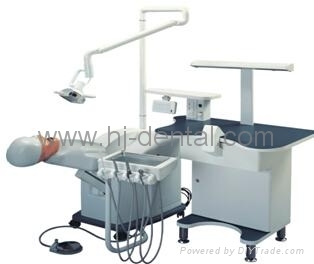 The JTJ series dental workbench with the accessories of clinical treatment system. Under the laboratory environment which simulate realistically various clinical treatment process; including inside of the outside of repair and orthodontic etc, attain the purpose of training and testing. 1 set of dental stool. The movements of the rise, drop and pitching of the cranium adopt by air control. The function can upgrade.